We offer a fantastic opportunity for you to promote your business using our Review Magazine which is distributed to 46,000 homes in South Staffordshire. 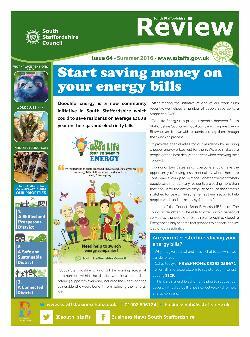 For over 20 years, the South Staffordshire Review has been a source of community information, arriving in people’s homes three times a year free of charge. Whether it’s finding out what’s on at the local leisure centres or learning more about the work of the Council and District Councillors, the Review is the first port of call for residents. In every issue of the Staffordshire Review , we incorporate business advertorial and advertising opportunities – giving local businesses the ideal platform to promote their business and/or tell local people about their stories, whether it’s celebration of 10 years in business, a new business or an expansion of your team. Local people can help grow your business. We offer a free design service for your advert, and different sized adverts to meet every businesses need. You can supply your own artwork for the advertisement or we can create it for you- free of charge by our professional designers. Adverts start at £100 + VAT which includes free design.